In real time and behind the scenes, brands are keeping up with the more-popular-than-ever US women's national soccer team during the World Cup. 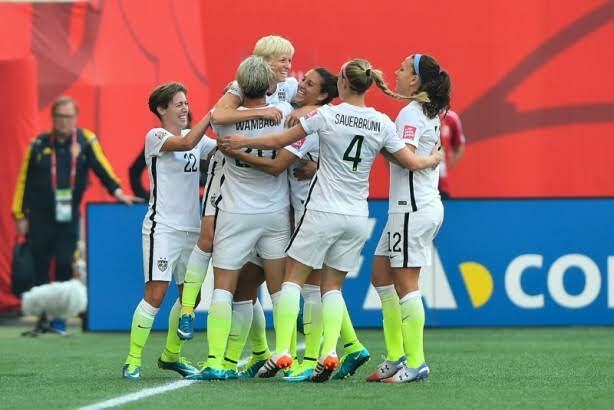 The 2015 FIFA Women’s World Cup has broken TV viewership records since kicking off last weekend. Brands are getting in on the action with videos and digital campaigns centered on the US women’s national soccer team and its players. On Monday, the US team’s 3-1 victory over Australia drew more than 3.3 million viewers on Fox Sports 1, beating the previous high for a group-stage game of 2.5 million in 1999. In anticipation of the World Cup capturing the nation’s attention, the US Soccer Federation launched a campaign called #SheBelieves at the end of May. It aims to deliver a message of empowerment, especially to young girls, says Neil Buethe, senior manager of communications at the organization, via email. "All 23 of these players believed in their abilities and potential and eventually made it to the highest level," he adds, in the email. "They want young girls to do the same, but it’s not just about athletic endeavors. It includes academic, professional, and personal goals and dreams." While social media is the focus of the campaign, it launched with grassroots events in which each player went to her respective hometown or current community to engage fans. The players received images and content from #SheBelieves community events to share on their personal Twitter and Instagram pages. US Soccer plans to use the hashtag throughout the World Cup. In addition to the #SheBelieves campaign, US Soccer has a series of YouTube videos, presented by Clorox, about each player called One Nation. One Team. 23 Stories. FIFA marketing director Thierry Weil told PRWeek via email that the organization is promoting the Women’s World Cup on FIFA.com and FIFA TV, as well as through an integrated social campaign across Facebook, Twitter, and Instagram. It’s using the hashtags #FIFAWWC, #LiveYourGoals, and #myFIFAWWC. One video it tweeted on Wednesday highlights the importance of volunteers during the tournament. Weil adds in the email that "there is no doubting the growth of the women’s game [from] the first FIFA Women’s World Cup in 1991." "This year, double the number of teams will participate (24) compared to 1991, while the number of participants in the qualifiers almost tripled from 45 teams in 1991 to 128 in 2015," he says in the note. As women’s soccer continues to grow in popularity, Stephen Chriss, head of consumer engagement for North America at Mondelez, says marketers are getting savvier about how to reach consumers in authentic ways around the sport. "At the same time, while we’re getting smarter, the media landscape is evolving," he says. "The growth of soccer and the growth of the second screen are colliding, so it’s a very interesting time to be a part of the soccer conversation." Video content is an important campaign element for many sponsors during the Women’s World Cup, says Buethe. Mondelez, which has a multi-year partnership with US Soccer, is continuing the Pass the Love effort it launched last year to support the men’s team in Brazil. However, this time, the company is incorporating more video content, particularly in real time, adds Chriss. Its campaign stretches across brands such as Ritz, Trident, and Chips Ahoy, with multiple consumer and shopper touch points in-store. Yet it also relies heavily on digital and social. Chriss says Mondelez saw the power of its social campaign in 2014 during the men’s World Cup, so this year, it is dialing up its efforts with more real-time and behind-the-scenes content with the players. The company is posting the content on PassTheLove.com, and each participating snack brand is using its own social channels to build buzz with the hashtag #PassTheLove, as well as #SheBelieves. Chevrolet recently posted a series of behind-the-scenes videos with the US women’s team. "We were able to ask them questions, not just about soccer, but about life in general and how they balance the two," explains Michael Weidman, national experiential manager at Chevrolet. The automaker is also planning to release another set of videos showing eight young girls from the Chevrolet Soccer Program and youth soccer organization Rush Soccer holding a "private press conference" with the players, adds Weidman. The discussions led to great life lessons for the youth players, he says. Weidman explains that women’s and men’s matches have "pretty distinctively different demographics," with women’s games drawing more families and children in attendance. Women’s matches, which also attract well-educated people with high incomes, allow the company to showcase its core vehicles such as the Malibu, Cruze, Equinox, and Traverse, he says. The company is using its ChevroletFC.com site, as well as its Chevrolet FC social handles, to engage fans throughout the World Cup. Its hashtag for the tournament is #AllGirlsPlay. Century 21 is advertising during the Women’s World Cup, but the real-estate company is also posting its commercials on social media. Some posts will include the hashtag #SmarterBolderFaster, the brand’s tagline, says Steve Gregersen, director of national advertising programs at the company. To engage employees, the brand launched a contest called Go Out and List. The two offices with the most significant increase in listings, year-over-year, will win a visit from members of the US women's team, including Olympic gold medalists Heather O’Reilly and Megan Rapinoe. Aside from the 23 videos it sponsored with US Soccer, Clorox has launched a program called #GreatAssist, through which it is sharing a film about the players’ stories. The brand is also asking fans to share their favorite #GreatAssist person, product or tip for a chance to win Clorox products. Other brands incorporating digital video into their Women’s World Cup initiatives include Tampax, Chocolate Milk and Nike.